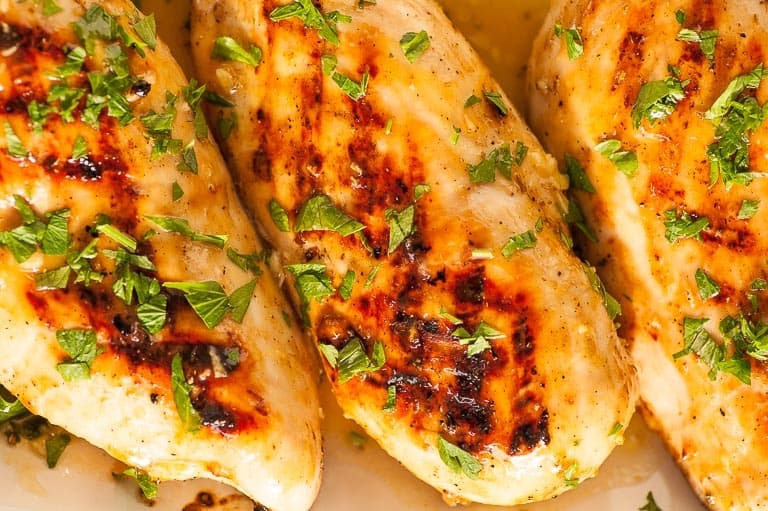 Honey mustard glazed grilled chicken is something to try next time you are grilling. 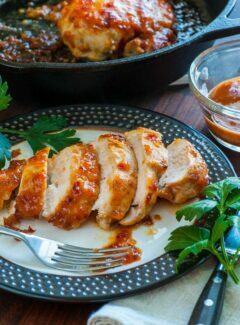 This glaze recipe contains 5 ingredients which contribute wonderfully flavorful tastes to the chicken. I realize that it’s a little past grilling time in much of the country but here in Florida we’re still having 90 degree temps. The humidity is high too bringing the dew points into the mid 70’s. Instead of heating up the house cooking indoors, grilling the chicken outside made so much sense. I don’t know if you’ve noticed, but chicken breasts these days are getting humongous! The one’s here were half a pound each and over an inch and a quarter thick. They took a full 20 minutes on the gas grill to get the internal temperature to 150 degrees. The government at foodsafety.gov says to cook your chicken to 165 degrees before resting. That much heat usually makes your breasts tough and dry. 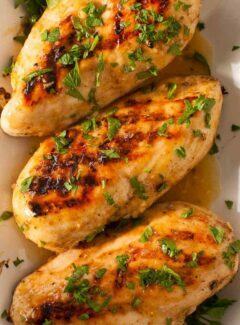 Usually, I cook chicken breasts to 145 to 150 degrees checking the temp with a instant read thermometer. I ran across a pretty good reference for grilling all types of meats…Grilling Temperature and Time. Another thing I do to insure the juiciest chicken is give the breasts a brine bath for about an hour before grilling. Just dissolve 1/4 cup salt and 1/4 cup sugar in 1 1/2 quarts of water, place the breasts in it and refrigerate for around an hour. Remove them from the water and pat dry with paper towels then proceed with your seasoning. 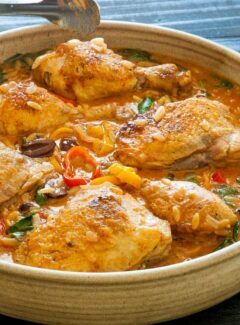 This will help to insure that the chicken stays moist and tender. I have posted a new chicken grilling brine recently and the link is…Simple Chicken Brine for Grilling. This honey mustard glazed grilled chicken recipe is nice too since it doesn’t burn like a barbecue sauce does. You can coat the chicken several times and turn it over without wondering if you’ll end up with a burned taste. This is a nice feature since these thick breasts require quite a bit of grilling time. 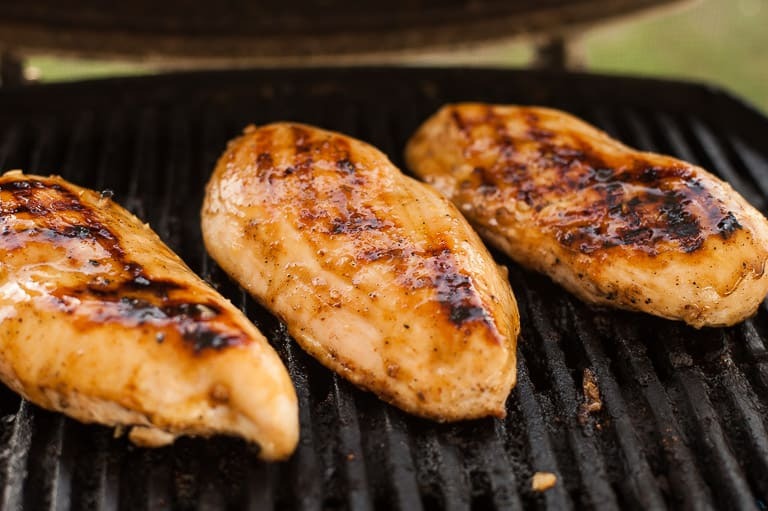 Give this a try next time you’re grilling chicken. I’ll bet everyone will love it! 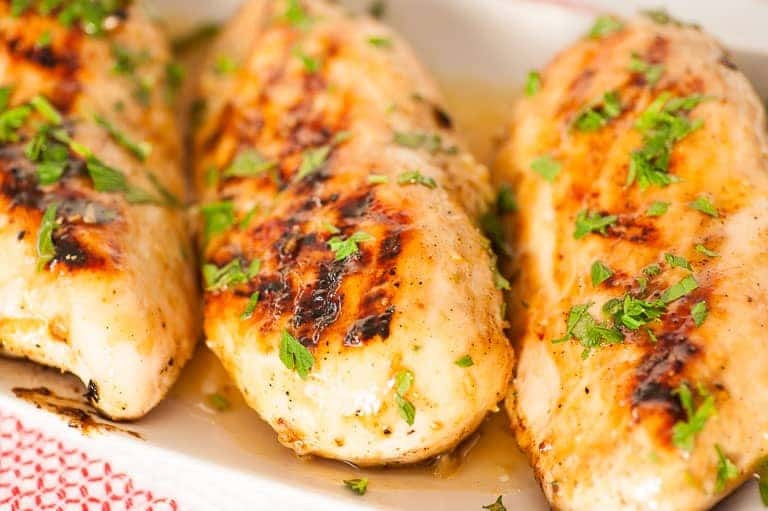 This 5 ingredient glaze for chicken makes for a tasty meal. 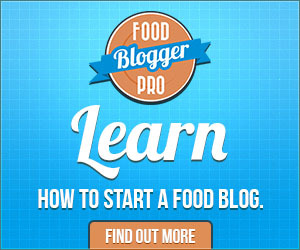 Dissolve the salt and sugar in water in a large bowl and place in the chicken. Refrigerate for 1 hour. Remove the chicken and pat dry with paper towels, then season. Melt the butter in a small bowl in the microwave, about 30 seconds, then add all the remaining ingredients and stir to combine. Pour 1/2 of the glaze mixture into another bowl to use as a drizzle after the chicken is grilled. Preheat your grill, about 10 minutes for gas and 5 minutes for coals. Clean the grate and lightly coat with vegetable oil. Salt and pepper both sides of the chicken then place on the grill, skin side up for 4 minutes. Coat the top side with the glaze then turn over and cook 4 minutes. Apply glaze to the second side. Continue to turn and glaze the breasts until the internal temperature is around 150 degrees, (or more to your liking). Place on a serving dish, coat with the reserved glaze and cover with foil 5 minutes. Serve right away. Garnish with chopped parsley if desired. 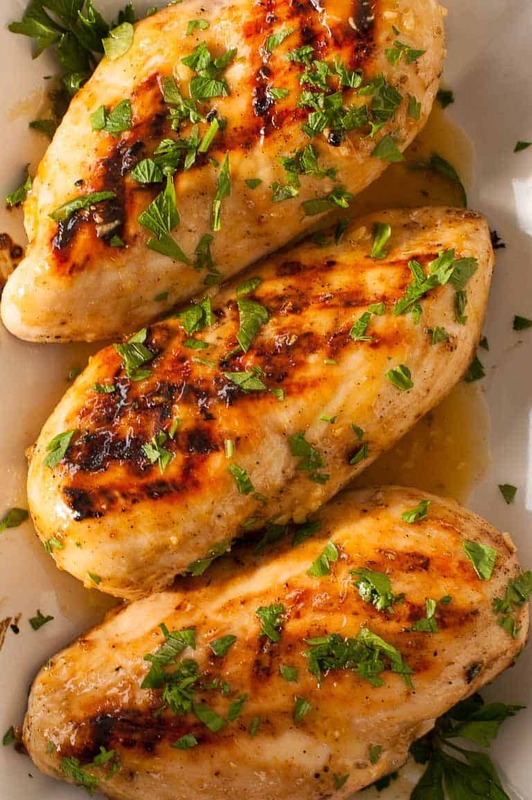 If you have smaller chicken breasts, the glaze would be enough for 4. Thanks for the nice comment Monica. These were really delicious and so tender and juicy! 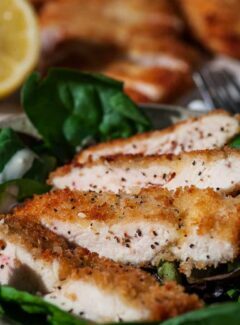 If it is as good as your other honey mustard chicken, it has to be good! Hi Eileen. It has great flavor which is subtly sweet and would pair well with buttered roasted potatoes. I’ll have to make it for you.